The Rhode Island Department of Environmental Management (DEM) and the Rhode Island Department of Health (RIDOH) announced that mosquito samples collected in Tiverton, Pawtucket and Westerly on June 26 have tested positive for Eastern Equine Encephalitis virus (EEE). These are the first findings of EEE in Rhode Island this year. 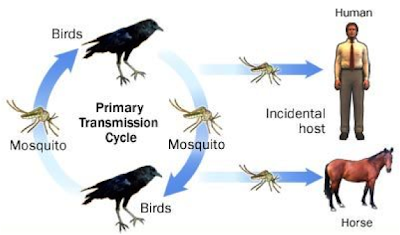 All the positive mosquito pools are species that bite birds and mammals (including humans). There are no confirmed human cases of EEE in Rhode Island. However, because summer and fall are peak seasons for mosquito-borne disease transmission to people, Rhode Islanders should be aware of the symptoms of EEE. Severe cases of EEE (involving encephalitis, an inflammation of the brain) begin with the sudden onset of headache, high fever, chills, and vomiting. In addition to EEE, Rhode Island tests mosquitos for West Nile Virus (WNV). To date, there have been no confirmed local findings of WNV in a mosquito sample. There are no confirmed human cases of WNV in Rhode Island. In partnership with RIDOH, DEM distributed mosquito larvicide to local communities in late May to treat area catch basins. Catch basins are prime breeding grounds for mosquitoes in both urban and suburban settings. Horses are particularly susceptible to WNV and EEE. • Horses are the most susceptible domestic animal, but other, less common species such as ratites (emus, ostriches, etc.) and camelids (alpacas and llamas) are occasionally infected. Owners of ratites and camelids should consult with their veterinarian regarding vaccination of their particular animals. Test results are pending for the remaining traps set on June 26 and additional traps set on July 5 and July 10, and will be included in future announcements. Typically positive test results trigger additional trapping to assess risk; today's findings will result in additional trapping in the Tiverton, Pawtucket and Westerly areas where the positive mosquito samples were found.